1. If you click on Join with Browser, you will join the meeting without downloading the app. You can watch the video, hear the presenter and chat, but you will not be heard or seen. 2. 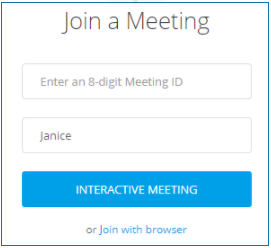 If you click on Interactive Meeting, it will automatically download the app at the very first time. And you can be more interactive during the meeting, for example, being able to heard/seen and sharing your screen. If you join another meeting the next time, you just need one-click to launch the app and join the room.